I are super glad you chose to visit my blog today. 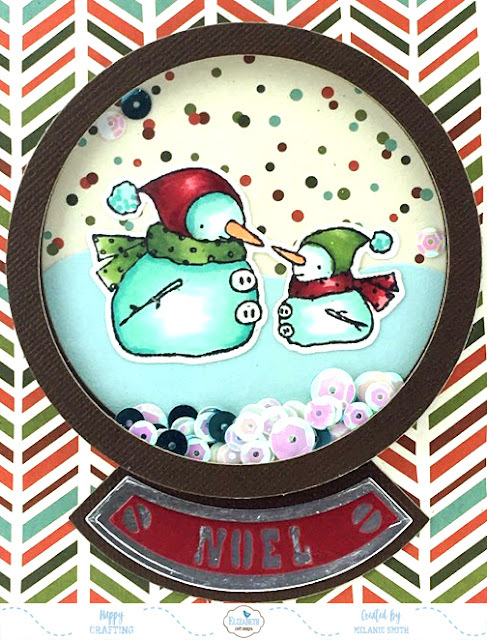 LDRS Creative has some amazing holiday dies in their new release and I decided I would create a fun card without using any stamps. I just love the way it turned out. This classy gold and ivory non traditional themed Christmas card is just stunning. When I saw these ornament dies I knew right away that I wanted to use them against a black background with gold and ivory. . . . These dies are so easy to use and always cut like butter. I love all the detail they give to my projects. Make sure to check out our entire new line of 4th quarter products. Here is a close up of the Grace Ornament Die just to show you the detail of these beautiful dies. I've used a gold foil paper that I had in my stash to give it even more of a shine. 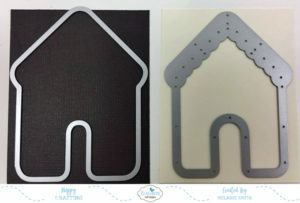 Elizabeth Craft Designs Pop Up Challenge!!!! I have a fun little project to share with you all today. 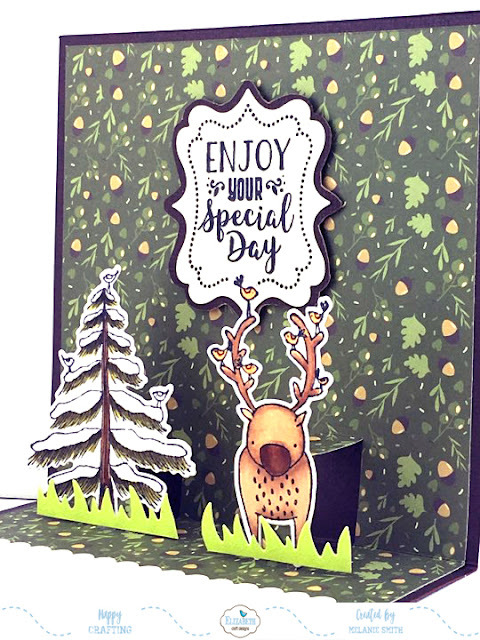 The Challenge theme for the month over on the Elizabeth Craft Designs Challenge Blog is Pop Up Cards. I decided to use some of our beautiful new papers by ModaScrap called Magic Mountain and to create a masculine card. The card front is quite simple using the fun wood designer paper as the focal and simply stamping the sentiments out and using Elizabeth Craft Dies to display them easily on the card front. The sentiments are from two stamp/die sets. 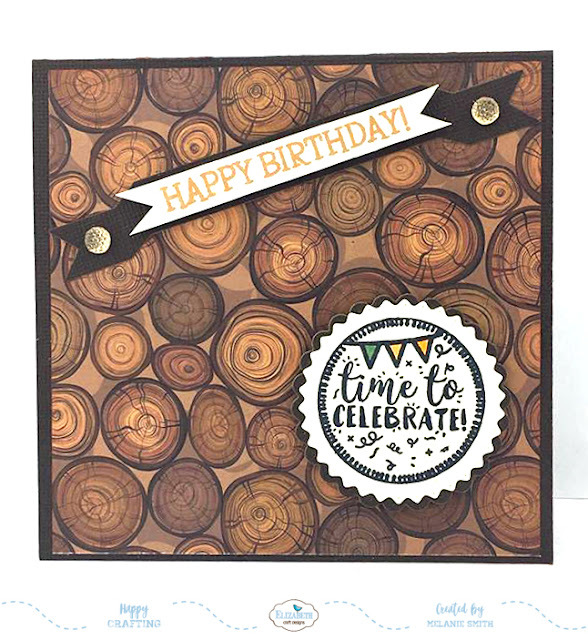 The Happy Birthday sentiments across the top of the card was created using the Banner Sentiments along with the coordinating Banners Dies. To create the "Time to Celebrate" sentiment above, I used the Birthday Sentiments Stamp Set along with the coordinating Labels 1 die set. These two sets really give you a lot of options and are a great value for the money. I absolutely love creating scenes. This scene was created using a few different items. The sentiment was made from the same set referenced above. 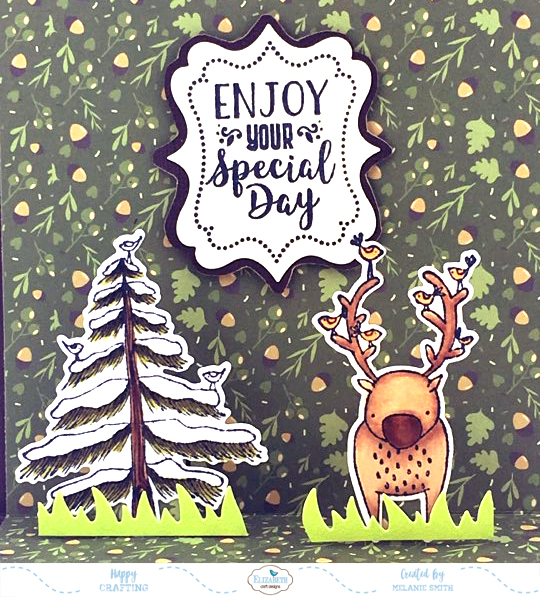 The stamp sets used for the tree and deer are Holiday Trees and Ornaments, Reindeer's and Birds, and Adventure edges for the grass. And lastly the General Pop Up dies, which makes the entire card. Check out all the details for the giveaway below.... Can't wait to see what you create!!! To create this card simply follow these steps. Step 1: Cut a 5" x 10" piece of red card stock and fold to create your card base. Step 2: Cut a piece of speciality paper measuring 4.75" x 4.75" and attach to the front of your card. "It's Christmas Time" paper by ModaScrap was used here. Step 3: Die cut all your pieces. Here are a few photos showing some of this process. 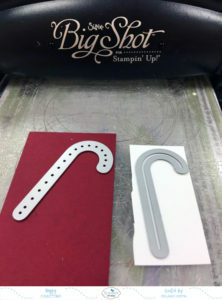 The candy cane cut at the same time using one die for red and the other for the white. 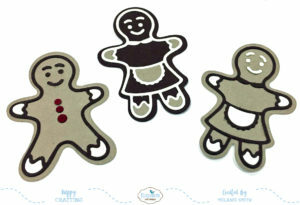 When you are done with all the die cutting simply glue all pieces together to create a fun and inviting gingerbread scene. 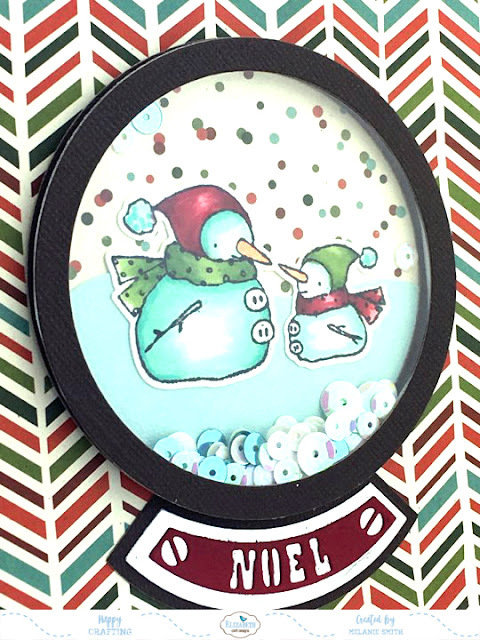 The sentiment was created by using a portion of one stamp from the "Holiday Cheer" clear stamp set. 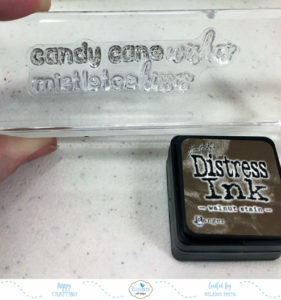 The stamp itself reads "Candy Cane Wishes and Mistletoe Kisses" and looks like this. 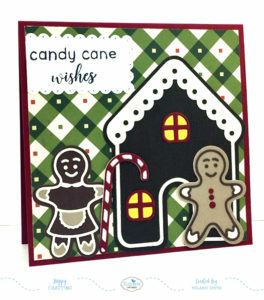 Carefully stamp just the "Candy Cane" portion first, as seen below, onto a Dotted Scalloped Rectangle die. Next carefully ink up just the word, "Wishes", and stamp it below the previous stamped words. Lastly to fit the sentiment into the scene without over lapping anything simply snip off the edge of the dotted scalloped rectangle and glue to the top left hand side of your card. 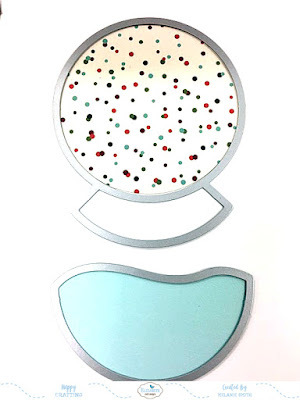 I have something fun to share with you today, a super fun shaker card. I have to admit I have not made many shaker cards so this was a labor of love. It was really fun though and I encourage all of you to give it a try! 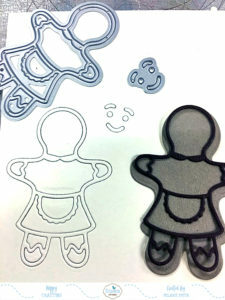 Step 1: Using the "Snowman & Gifts" clear stamp set along with the coordinating dies color and cut these adorable snowmen. Copics were used in the samples in this post. Step 2: Cut a red card base measuring 5.5' x 11" and fold in half. Step 3: Cut a piece of silver foil card stock to 5.25" x 5.25" square and attach to card front. Step 4: Cut a piece of holiday patterned paper, from the "It's Christmas Time" Paper Pack from ModaScrap, to 5" x 5" and adhere to the card front. 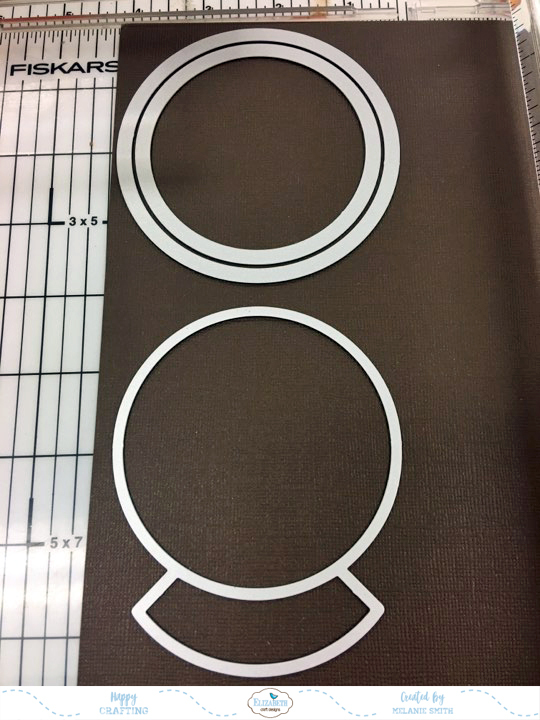 Step 5: With a die cut machine and the "Snowglobe Scene" die set, cut one snow globe as seen in the photo below, and cut two rings by placing two circle dies inside each other as shown in the photo. Circle dies from the "Fitted Circles" were used to achieve the perfect size ring. From the largest circle die also cut 1 piece of clear acetate so that it forms a solid circle rather than a ring. You should now have the following pieces... plus one solid acetate circle the size of the globe itself. Step 6: Cut a circle from the snowglobe die with ModaScrap "It's Christmas Time" paper. You will trim off the bottom of the globe, because you just need the circle. Then using the slope die simply cut a piece of light blue Soft Finish Card Stock to act as snow for our snowy scene. Now you are ready to assemble the snowglobe as seen here in the picture below. You will layer your pieces in the following order. 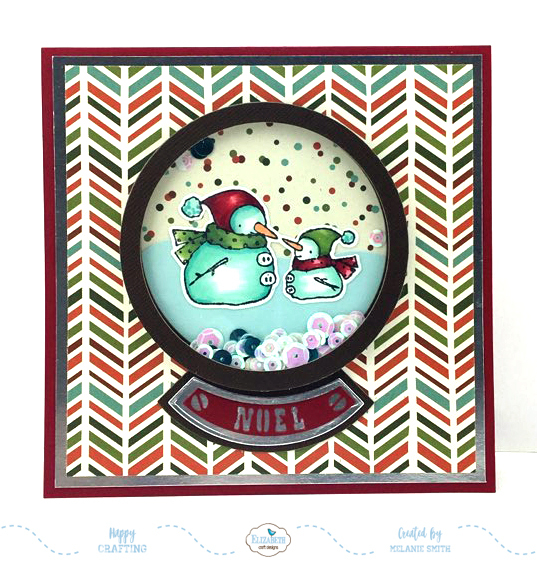 Attach the full Snowglobe cut in step 5 to the front of the card. Next layer the spotted background circle and the snow bank piece onto the snowglobe base, these were cut in step 6. Take one of the brown rings and glue it around the outer edge of the snowglobe. This will act as a guide in the following steps. Using foam strips stick down an entire ring of tape which gives you the depth that the sequins will need to move around. At this point it is good to use an embossing buddy over the surface of your scene so that the sequins will not stick once enclosed inside. With the last ring and the acetate glue these together being very careful not to get glue onto the acetate where it might show. Lastly, add sequins on top of the snowmen, peel off the release sheet from the foam tape, and simply place the ring/acetate piece on top capturing your sequins inside. I am getting excited about all the brand new products being released for the holidays....or should I say "Holly Days"? 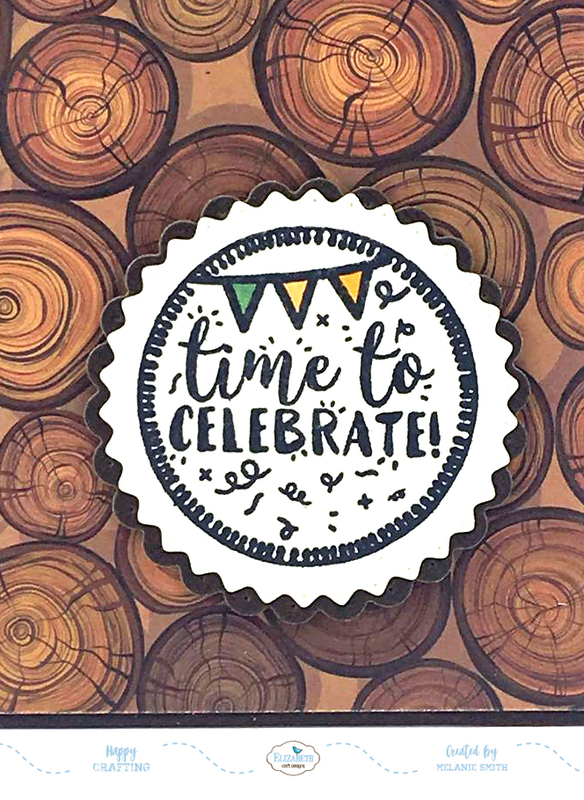 Little Darlings Rubber Stamps has released a beautiful collection of stamps and dies, and everyone knows how much I love DIES!!! Check out my favorite die set from them below. It is called the Holly Wreath Circle Die Set. See the entire collection HERE. 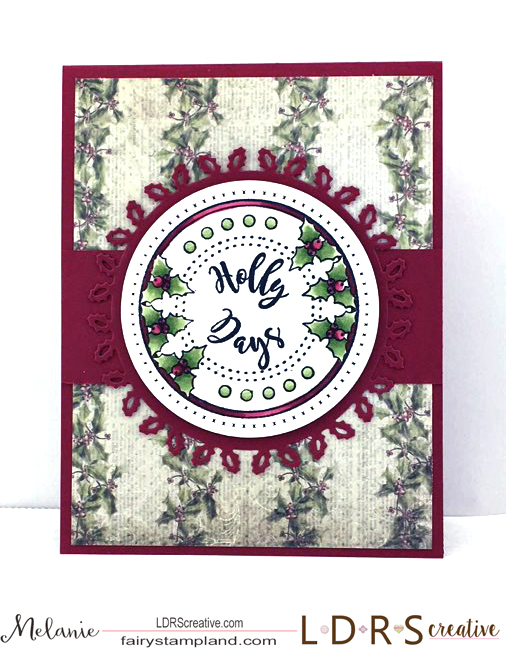 I love how this dainty floral die fits perfectly with the Holly Days Large Circle Die Set. This sentiment set has room to color in your sentiments to coordinate with your projects. I colored in the leaves and berries on mine so that it would match the paper. Below is a closer look at the entire die/sentiment pairing. I just love it when dies and stamps coordinate don't you???? For my project I have used three of the new products by LDRS Creative. I started with a piece of paper from the Polkadoodles Winter Land 6x6 Paper Stack. From there I choose a coordinating piece of Cherry Cobbler card stock and I die cut this amazing Holly Wreath Circle Die. I stamped out the "Holly Days" circle stamp onto Copic Xpress It paper and I hand colored in the holly in, giving it a rich look. Then I realized that the pierced circle die from the Holly Wreath set PERFECTLY for these circle sentiments so make sure you check them out HERE. 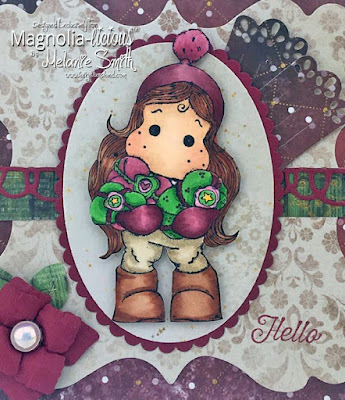 Magnolia-Licious Challenge Blog Post ~ Optional Theme "The Holidays"
Today I am sharing with you Magnolia-licious' Monthly Challenge post. This month we have an optional theme for the holidays. I am using Snowy Tilda from the 2015 Lovely Christmas Collection. Isn't this sweetie adorable in the rich Burgundy's and neutrals? I have stamped and colored her on Copic Xpress It paper and then I fussy cut her out and mounted her onto an oval die set using mini Dimensionals. This just gives her a little lift and extra interest. 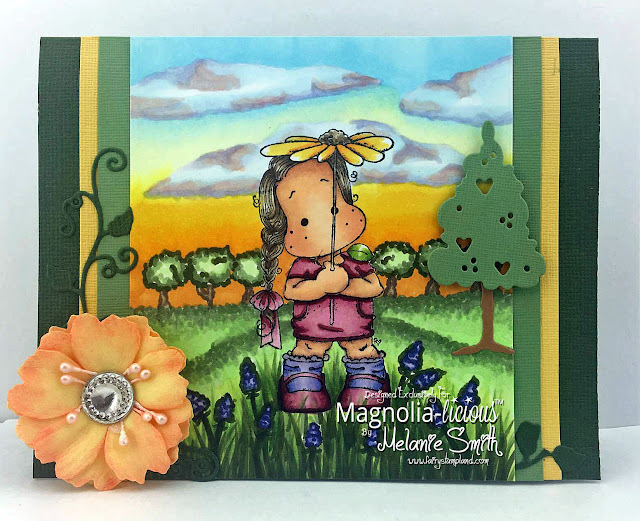 I have used numerous Magnolia Doohicky Dies including the Vintage Square set. I also used numerous dies from the Vol. 7 Doohikey Set. The paper is from the Lemon Craft Christmas Carol 6x6" paper stack. which is available in the Magnolia-licious online store. I also added one of our Pearl Button Flower Centers which I am in love with.... I want them in EVERY COLOR!!! They are so affordable too! I am starting off November with a project I am super proud of. 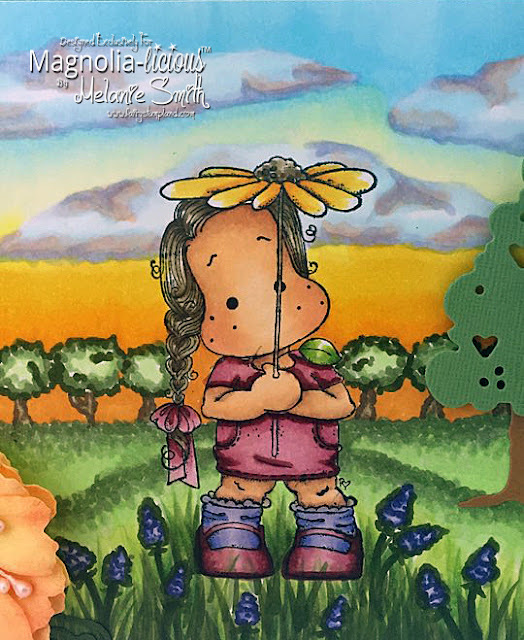 This is Magnolia's Tilda w/ Umbrella and she is part of the "Yay - It's Your Birthday 2017" Collection. As you can see I created an entire scene with this little lady. Following a tutorial from Kit & Clowder online coloring classes. These classes are truly amazing. I have used yellow Foamiran along with some peach stamen from Magnolia-Licious. I cut these flowers out using Whimsy Peony dies and I have colored the Foamiran with Gelatos. Here is a close up of the coloring. Everything is drawn in except for Tilda herself. 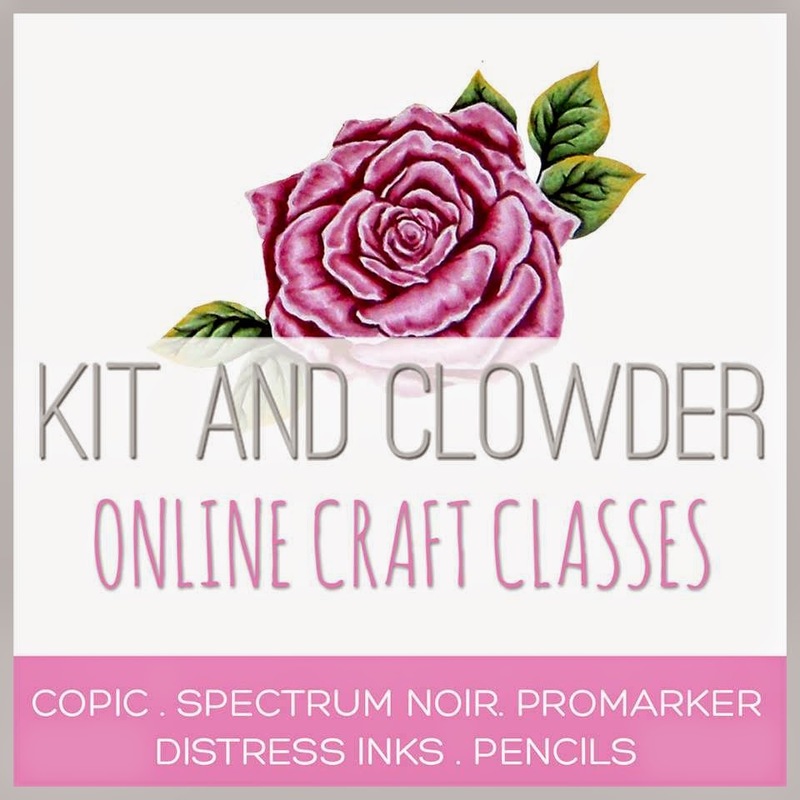 Alyce with Kit & Clowder is an amazing instructor and you could also color like this just by following her videos.